What are inciting incidents? Why do our stories and scenes need them? What are the elements of a solid inciting incident? This week, I discuss these story event catalysts in the context of the opening of Drew Horstman’s fantasy novel, Nicholas Crumb. The editorial mission encourages you to collect inciting incidents by reading and watching stories—and from your own life. When an Inciting Incident occurs it must be a dynamic, fully developed event, not something static or vague. This, for example, is not an Inciting Incident: A college dropout lives off-campus near New York University. She wakes one morning and says: “I’m bored with my life. I think I’ll move to Los Angeles.” She packs up her VW and motors west, but her change of address changes nothing of value in her life. She’s merely exporting her apathy from New York to California. The inciting incident is a story event that changes some aspect of life for the protagonist or point of view character. You could also say something upsets the status quo or the ordinary world of the story. This event is a major turning point, though it’s different from theturning point we’ll talk about in the context of story or scene conflict, or progressive complications. The inciting incident is a catalyst for everything that follows within the scene or other unit of story. To get a clear sense of how this works in context, consider the basic story structure shared by former Pixar story artist Emma Coats.Now let's look at the submission. Within this fill-in-the-blank story, the sentences that begin “Once upon a time” and “Every day” describe the status quo or ordinary world. The protagonist is living her life and minding her own business. “One day” is the inciting incident, and that’s when life begins to change. You’re probably familiar with the hero’s journey, in which the inciting incident is the call to adventure. Christopher Vogler, in The Writer’s Journey, tells us “The hero is presented with a problem, challenge, or adventure to undertake. Once presented with a Call to Adventure, she can no longer remain indefinitely in the comfort of the Ordinary World.” A great example of this is in Star Wars when Luke receives a message requesting help from Princess Leia. The Virgin’s Promise by Kim Hudson describes a feminine archetypal journey in which the protagonist (which can be female or male), follows their dream or comes to express their true nature. In stories of this type, the opportunity to shineis the inciting incident. This is “the action that leads to the first expression of the Virgin’s potential.” A great example of this can be found in Billy Elliotwhen Billy observes a ballet class and becomes aware of his deep desire to dance. In the Story Grid Universe, we sometimes use the Kubler-Ross change cycle as a guide for story structure, and its inciting incident is the shock to the system. A great example of this occurs in Kramer vs. Kramerwhen Joanna Kramer tells Ted she’s leaving the family. Understanding why we need an inciting incident helps us better understand their elements and how to craft them. So, why are they required? Because stories are about change, and individuals (and societies) don’t embrace change. We resist it, even when it’s for the better. There must be a shock to the system, an enticing call to adventure, or some other drastic event to give us a nudge out the door. This is true of the global story, the scene, or any other unit of story. Change requires an event that makes us uncomfortable enough to consider altering our course. In an Action Story, the Villain attacks. In The Martian, the force of antagonism is the environment, a storm arises that causes debris to puncture Mark Watney’s suit and destabilizes the lander unit, causing the captain to end the mission prematurely (coincidental). In a Crime Story, a crime is committed or discovered. In Murder on the Orient Express, the body of Samuel Ratchett is found in his first class compartment (causal). In a Horror Story, the monster attacks. In Alien, an alien life form attacks one of the crew members while exploring an alien environment (coincidental). In a Thriller, there is an inciting crime indicative of a master villain. In Fight Club, the villain blows up the narrator’s apartment (ambiguous). In a War Story, the force of antagonism attacks. In Platoon, while out on patrol the soldiers are ambushed (causal). In a Western, the villain or environment attacks. In True Grit, Tom Chaney murders Frank Ross (causal). In a Love Story, the lovers meet. In Bridget Jones’s Diary, the protagonist meets Mark Darcy (coincidental). In a Performance Story, the protagonist is offered an opportunity to perform. In Billy Elliot, the protagonist observes a ballet class, is asked to join in, and discovers his deep interest in dance (coincidental). In a Society Story, a speech by a visionary or crime that serves as an inciting threat to the reigning power. In Animal FarmOld Major tells the other farm animals about his dream and the nature of their life on the farm (causal). In a Status Story, the protagonist is offered an opportunity or challenge. In Gladiator, Marcus Aurelius asks Maximus to be his heir and to return the power of Rome to the people (causal). In a Worldview-Maturation Story, there is an inciting opportunity or challenge to the character’s naïve understanding of the world. In The Curious Incident of the Dog in the Night-Time, the protagonist discovers that someone has killed his neighbor’s dog and his father doesn't want him to investigate it (coincidental). In a Morality Story, there is a shock that upsets the protagonist’s hibernating self. In A Christmas Carol, Christmas Eve arrives. Here are some great examples of inciting incidents in films. What Are the Elements of an Inciting Incident? Now that we understand their purpose, let’s look at the elements of an inciting incident. An event upsets the status quo. This must be significant. If the protagonist only shrugs his shoulders in response, the story or scene won’t go anywhere. The event must cause the character to react. The upset causes a desire to arise within the character. This is often, but not always, a desire to restore the status quo. The desire becomes a goal. The goal could be an attitude or belief, the acquisition of some object, or a change in circumstances. These elements won’t always be spelled out in your scene. In fact, doing so can create awkward and clunky writing. As the writer, you should have a clear idea of what the elements are, and they should be apparent to the reader if they were to give it some thought. What Are the Qualities of an Inciting Incident? Inciting incidents can be positive or negative. A character receives a financial windfall, or a teacher encourages students to seize the day. A man is shot and killed in the middle of town, or an enemy ship fires on a frigate. Inciting incidents can also be a causal, active choice or coincidental, or ambiguous. A character sets out on a journey or decides to leave their spouse. A shark attacks swimmers, or two men of great fortune move into the neighborhood. *The apartment explosion in Fight Club is ambiguous at the start of the story. We don’t just don’t know whether it was some kind of accident or deliberately set up. Literal action: Goldhawke eliminates the monster while keeping Mortimum and Scribbage from sabotaging her efforts. 3. What life value has changed for one or more characters in the scene? 4. Which life value is most relevant to the global genre, the one that would go in a Story Grid spreadsheet? That depends on what the overall genre is. So from this analysis, we know Goldhawke's essential action or scene goal: eliminate the monster. But we don’t see on the page when the desire (to be successful in the assignment or similar) and goal (to eliminate the monster) arose, in other words, we don't actually see the inciting incident. There is a possible alternate interpretation of the submission: It could be that her goal is to investigate a disturbance and then when she discovers it’s a monster (turning point) she does away with it, but there isn’t an inciting incident when she’s given that assignment either. 2. What is the Turning Point Progressive Complication? The monster busts out of the room where it was being held while Mortimum fumbles with his gun. Does Goldhawke run away or shoot to defend Mortimum? Goldhawke shoots the monster, saving Mortimum. 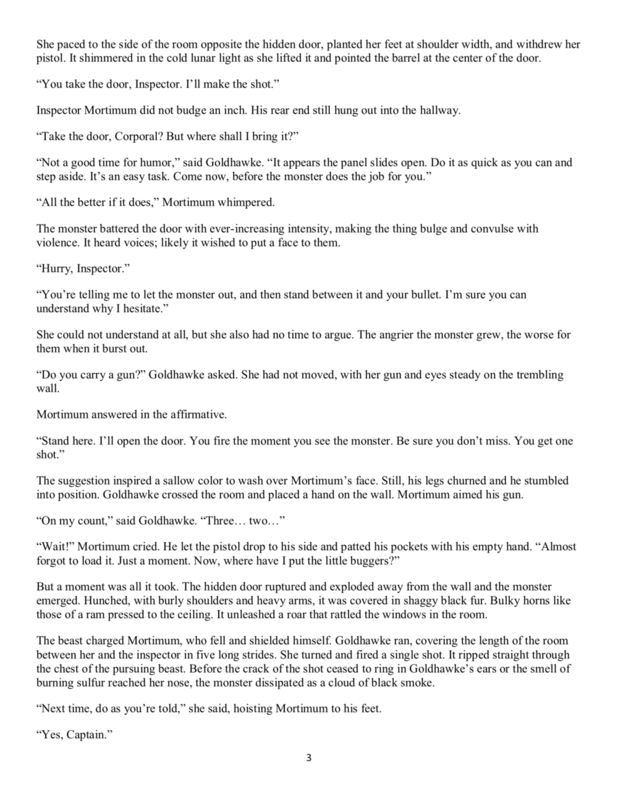 The monster dissolves, and Goldhawke examines the room where the monster was held. So what does this tell us? If I have an accurate picture of the scene, then we can see the following. The scene turns, that is, there is a change from the beginning to the end of the scene. The scene has four of the Five Commandments of Storytelling. The life value changes are relevant to the conflict within the scene. The present commandments seem relevant to the main conflict in the scene. Goldhawke's literal and essential actions seem consistent. 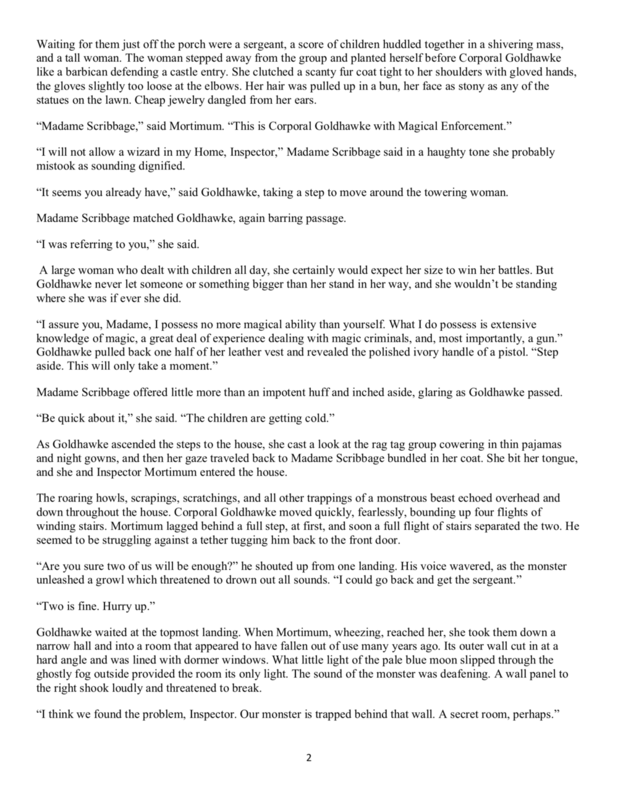 The scene as written is fairly solid, but since this is the first scene of the story, I recommend making the inciting incident more clear on the page. This might amount to a couple of sentences to a paragraph at the most. I mentioned the Crisis Question in the recording because I wanted to explain that the choice (to run or defend Mortimum) is present, even though Goldhawke, being who she is, would not run from this fight. The author could have her think a funny thought about not defending Mortimum, but given the tension in this part of the scene, it's probably more effective as written. The author would want to consider this advice in light of what they know about the rest of the story, especially if any of my assumptions are wrong, but overall, we have a solid working scene here with the exception of a clear inciting incident. As you read or watch stories, identify the event that kicks things off and throws life out of balance for the main character. Can you identify the four elements? How about whether it’s positive or negative? Causal or coincidental? 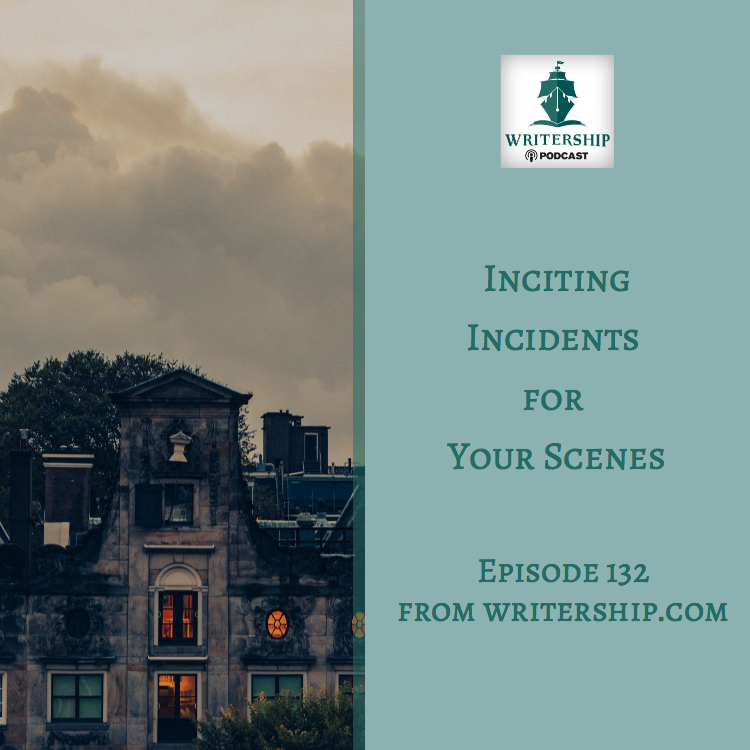 Start a list of the inciting incidents in stories and scenes you encounter. This will become a treasure trove of possibilities as you plan, draft, and revise scenes for your stories. In the context of your own life, consider the inciting incidents you’ve experienced. Look at small and large events, causal and coincidental, positive and negative. How did you feel when you were in the middle of the event? How did you react? What did you do? Keep a list of your personal inciting incidents. Then, as a regular exercise, write about them. Your reactions and emotions can inform what your characters think, say, and do in analogous circumstances.This is what’s really behind the advice to write what you know.